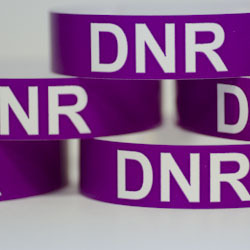 Our Alert Wristbands are made of a latex-free polyester material that is waterproof and safe from sensitive skin. Polyester wrist bands are waterproof and more durable and secure than Tyvek wrist bands. They are stretch-resistant and strong, yet lightweight and flexible. They are ideal for multi-day use and/or rugged wear. They come in vibrant, solid colors for excellent visibility and identification. 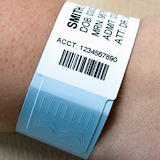 However, the national association recommends hospitals to apply several wristbands risk-reduction strategies. For instance, the alert wristbands should be placed on the same arm as the patient's ID band. Hospitals should use preprinted or embossed wristbands, and no one should write on the wristbands. To avoid confusion, nurses should ask the patient to remove all "social cause" wristbands, and if the person refuses, to have him or her sign an, acknowledging the risks, form. Easy to use - Easy to order! That's easy as EasyID! For more information about barcoded wristbands and their applications in the healthcare industry, contact our patient Identification specialists. or our Patient Alert Wristband Product List page.